An understanding of mechanisms underlying seizure disorders depends critically on the insights provided by model systems. In particular with the development of cellular, molecular, and genetic investigative tools, there has been an explosion of basic epilepsy research. Models of Seizures and Epilepsy brings together, for the first time in 30 years, an overview of the most widely-used models of seizures and epilepsy. Chapters cover a broad range of experimental approaches (from in vitro to whole animal preparations), a variety of epileptiform phenomenology (including burst discharges and seizures), and suggestions for model characterization and validation, such as electrographic, morphologic, pharmacologic, and behavioral features. Experts in the field provide not only technical reviews of these models but also conceptual critiques - commenting on the strengths and limitations of these models, their relationship to clinical phenomenology, and their value in developing a better understanding and treatments. 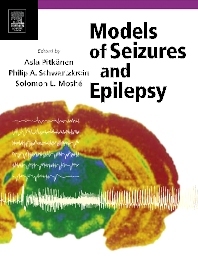 Models of Seizures and Epilepsy is a valuable, practical reference for investigators who are searching for the most appropriate laboratory models for addressing key questions in the field. It also provides an important background for physicians, fellows, and students, offering insight into the potential for advances in epilepsy research. Neurologists, epileptologists, developmental neuroscientists, medical geneticists, molecular/developmental biologists. 1. What Should Be Modeled? 51. Animal Model Development Based on the Human Epilepsies: Which Causes and Syndromes Should Be Modeled? Dr. Pitkänen is currently a Professor of Neurobiology at the University of Eastern Finland in Kuopio, Finland. She has over a 30 years’ experience in working and developing animal models of acquired epilepsy and phenotyping of epilepsy models, using histologic and molecular analysis, behavioral tests, long-term video-EEG and MRI imaging. She is a leader in epilepsy research and has participated in several NINDS on Epilepsy Models Workshops and worked in several ILAE Committees related to preclinical modelling and use of models to develop better therapies for epilepsy. She has an h-index of 52 and has over 279 publications.